Can you believe it? I have been babbling along to myself (or anyone else in the world that wants to read it) for 4 years. In truth I never really knew what blogging would bring. It seemed like a good idea. Something to keep my brain active whilst looking after the boys. Other people to chat to in the evenings when my husband was working away. In that way not much has changed. Being a stay at home Mum can be lonely and blogging makes you realise you are not alone. Whilst I have had some concerns about the negative side to blogging recently, I want to look for the positives. Because there are so many, when you aren't getting caught up in the stats and shouting malarky. 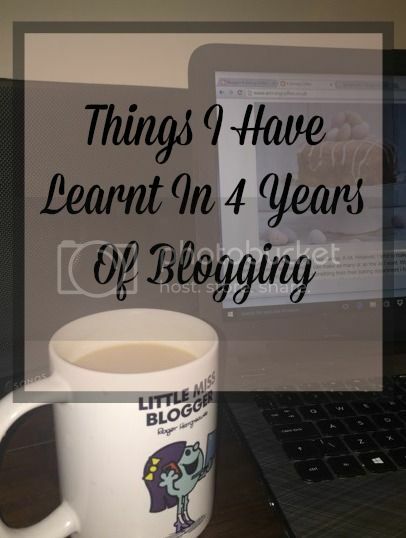 I have learnt that I like blogging for me. Partly for my sanity as a SAHM, whose husband works away too much, and partly as a record of our life as a family. By far my favourite posts are the ones I write for me. Tales of my boys. I still chuckle at whether middle man is a cat or dog. It is a way for me to document memories. Stories I can look back on fondly. This is the first and foremost reason that I blog. I have also learnt that not everyone on the internet is a crazy weirdo, contrary to popular belief. Obviously there are some but overall I have met some fantastic people through blogging. Suzanne from 3 children and It was one of the first bloggers I met. She had recognised my gym in a photo and it turns out we live a mile apart. I still remember my husband asking me if it was safe for me to meet her in a pub. After all she could be an axe murderer. I am pleased to say that I survived the evening without any injury or sight of axes. The boys are always happy to look after her geko. Hell I am. He gets more instagram likes than my boys do. There is a blog that everyone can identify with. For crafts Jennifer has it covered, cakes I head to Jenny's. Jess started her blog at the same time as me and I love her family photos and tales of their travels. Afra and Swazi are two people that make you feel as though you have known them for years. As an introvert at a huge blogging event, it is great to have such lovely people around you. I could go on and on. I read blogs where I can and I have given up on trying to comment on every post. I have learnt that stats are not everything and that getting too focused on them is bad. As with many jobs, hard work pays off in the long term and it is often the case of it is not what you know but who you know. Nothing is free. I have learnt that it is fine just being me. That I shouldn't be embarrassed that I blog and if people want to judge then they aren't worth the time. I have learnt that I like my little space on the internet. So here's to another 4 years and everything it brings.